A palm and a branch grow out of a log in which is a hive of bees. A banner running from the palm to the branch bears the motto: "in tenebris fulget." 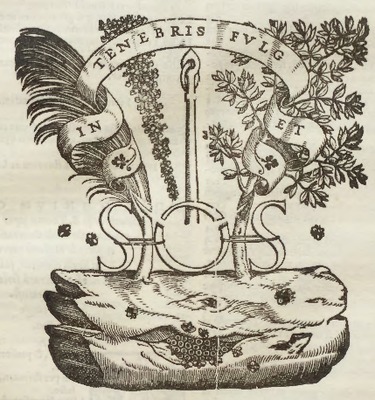 Secured to the palm and branch are the initials S,O,S. In the center what looks like the top of an anchor or key. Bees swarm to the left of center, while other bees fly about. From: Aquinas, Thomas, St. In libros Aristotelis De Generatione et Corruptione. Venetiis: apud Heironymum Scotum, 1555.